It’s always heartening to see debut comics fairs and festivals popping up in new venues so we’re delighted to hear that small press stars Ioan Morris and 2017 Broken Frontier ‘Six Small Press Creators to Watch‘ artist Josh Hicks are putting together a new event in Wales in March – the snappily and alliteratively titled Cardiff Comics Festival. 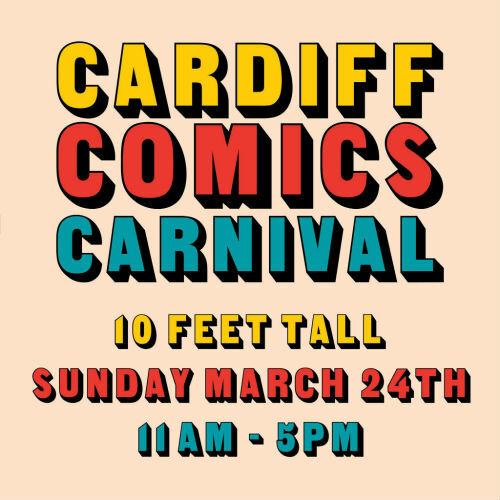 Cardiff Comics Carnival will be taking place for the first time on Sunday March 24th, 2019 at 10 Feet Tall, Church St, Cardiff. Running from 11am – 5pm, the event will be a day-long celebration of small press comics, zines and illustrations showcasing some of the best talent from Wales and beyond. Organised by Cardiff-based artists, Cardiff Comics Carnival is a grassroots effort to further develop a vibrant, thriving DIY comics scene within the city. With free entry to the public and a space right in the middle of Cardiff’s city centre, Cardiff Comics Carnival hopes to serve as a platform for creators to reach a new audience, as well as being a chance for the public to engage with the comics medium and discover a wealth of new and exciting artists. Audiences can expect to see work from both established and upcoming creators across a wide range of genres, and the event aims to showcase the variety and depth within the UK scene today. The venue, 10 Feet Tall – a bar and events space – is a five-minute walk from Cardiff Central bus & train station, and is allocating its top two floors to creators and public for the full day. I’ve been making comics out of Cardiff since 2014, and since starting out I’ve always hoped someone would set up a comics and illustration show like the kinds you find in places like Bristol, Leeds, London and Brighton. Cardiff has a vibrant arts scene and a there’s definitely an audience here for stuff like this, and so when the opportunity came to run a show ourselves, me and the guys jumped at the chance. We want CCC to bring together a wide range of artists and to really be indicative of the depth of work available in the UK — and Wales specifically. Though there’ll be some superhero and genre stuff at the show, we wanted to curate a group of artists that can really give an insight into what the medium can do. Though comics are the focus, we’re also keen to show off other illustrated and published work, so artists working in zines, prints and clothing will also be represented. Hopefully there’ll be something for everyone. Ideally this will be the start of fostering a more robust comics scene in Cardiff. At the very least, it’ll be a great day of celebrating comics and illustration in a three-storey bar. It’s win-win! The idea to run a small press comics fair in Cardiff has been in my head for several years. When Josh and I have exhibited at various fairs and conventions across the UK, talk on the long car journeys back invariably turns to having something similar closer to home. 10 Feet Tall must’ve read our minds, because they were the ones to approach us – there was no longer an excuse! We’re especially pleased that Cardiff Comics Carnival will be free to enter. There are so many talented cartoonists, zine makers and illustrators in the area producing beautiful work and we’re keen that as many people as possible get to see it. Comics and zines are unlimited in their scope – from the autobiographical to the fantastical and everything in between – so there’s bound to be something to appeal to you (yes, YOU). If you’ve never been to an event like this before, all the better. In fact, I envy you! The world of small press has never been healthier, so you’ve chosen the ideal time to jump in. We hope to see you on March 24th. Thought Bubble 2017 Preview: Dirty Rotten Comics #11 – Throwaway Press’s Flagship Anthology Returns with Work by Josh Hicks, Becky Howard, Jenny Robins and More!